Stackable birthstone rings are a beautiful way to wear your love. Each stacking ring is a circle of marquis birthstones and is stamped with an initial ~ they look great alone or stacked with our other birthstone bands! Get one to represent each of your children or grandchildren. Click here to design your own stacking ring~mix and match the different stacking birthstone shapes! You can mix and match bands using this listing. 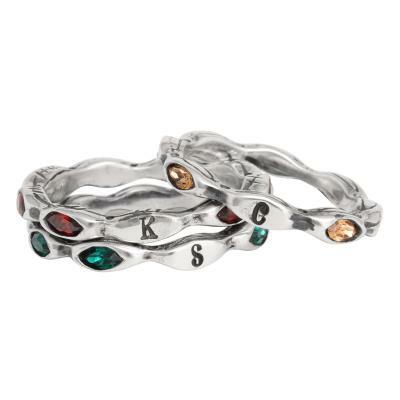 Stacking Birthstone Rings stamped with an initial are the perfect mother's birthstone ring. Each infinity band has birthstone crystals for the month chosen and an initial stamped on a silver blank. Stack multiple rings together to create a special ring! Mix and match styles to create the a unique birthstone ring.